A bg8 file extension is related to the Atari picture image file format used by 8-bit ATARI computers. What is bg9 file? How to open bg9 files? The bg9 file extension is associated with the Atari 400, 800, 130 XE and XL a family of 8-bit computers released in 1979 and discontinued in 1992. 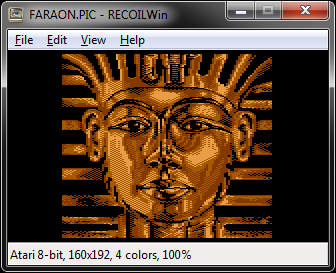 The bg9 file stores picture image compatible with 8-bit Atari (160x192 resolution). This bg9 file type entry was marked as obsolete and no longer supported file format. Use RECOIL to open *.bg9 files. and possible program actions that can be done with the file: like open bg9 file, edit bg9 file, convert bg9 file, view bg9 file, play bg9 file etc. (if exist software for corresponding action in File-Extensions.org's database). Programs supporting the exension bg9 on the main platforms Windows, Mac, Linux or mobile. Click on the link to get more information about RECOIL for view bg9 file action.